Ian is a Senior Associate focusing exclusively in federal procurement law. Ian has a wide range of experience with federal procurement topics, including bid protest litigation and regulatory compliance. Ian is a seasoned litigator having pursued bid protests before the Government Accountability Office, Court of Federal Claims, and Court of Appeals for the Federal Circuit. Ian has also pursued and defended a size protests before the SBA. Additionally, Ian has also assisted clients filing certified claims and pursing appeals before the Boards of Contract Appeals. On the transactional side, Ian is well versed in regulatory compliance issues. Ian has assisted clients with 8(a) and SDVOSB applications. He has work worked with SBA Mentor-Protégé program participants and advised on joint venture compliance issues. In addition to his legal contributions, Ian also brings a diverse educational background to Koprince Law. Ian double majored in Political Science and Chemistry as an undergraduate. His scientific training is frequently an asset to clients working in technical fields where his familiarity with technical concepts allows him to communicate more than just legal concepts. To this end, Ian’s interests span a wide range of technical topics including nuclear regulatory policy to aerospace engineering. In his personal time, Ian plays guitar in the University of Kansas Law School’s faculty band, the Moody Blue Books. Ian also dabbles in woodworking, and has been known to pick up an Xbox controller on occasion. Ian can be reached by telephone at (785) 200-8919 or by email at ipatterson@koprince.com. “Government Contracting: Common Pitfalls for the Unwary Contractor (and Attorney).” Co-Presenter. Douglas County Bar Association March 2019 Brown Bag CLE, Lawrence, KS. “Realities of Cost Recovery in the Wake of the Federal Shutdown.” SmallGovCon 2019. “Agency May Request SDVOSB Recertification on MATOC Orders, Says GAO.” SmallGovCon 2019. “SBA Proposes Big Changes to the HUBZone Program.” SmallGovCon, 2018. “GAO Recommends Successful Protester Be Placed in MATOC Pool.” SmallGovCon, 2018. “GAO: Protest Sustained Where Agency Improperly Applied Adjectival Ratings.” SmallGovCon, 2018. “OHA Lacks Jurisdiction to Hear HUBZone Status Appeals.” SmallGovCon, 2018. “Don’t rely on auto-generated EPDS filing emails, says GAO.” Westlaw Journal Government Contract, 2018. “Offeror Unintentionally Files Size Protest, Confuses SBA OHA.” Westlaw Journal Government Contract, 2017. 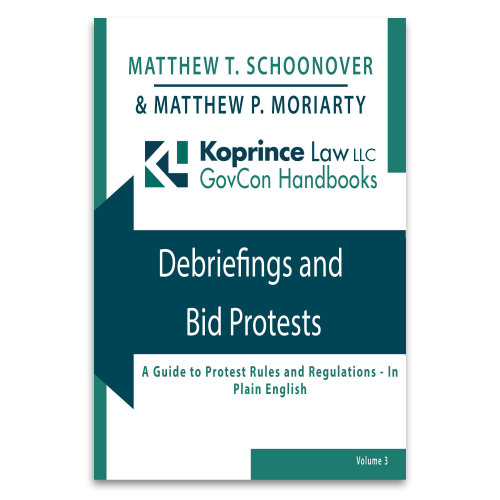 “Successful Protester Paid upon Receipt of Costs – If Only it Were So Easy.” The Procurement Lawyer, 2017. “GAO Protest Sustained Where Agency Improperly Applied Adjectival Ratings.” YouTube, 2019. “GAO Reviews Agency Actions in the Wake of Equifax Data Breach.” YouTube, 2018. “SDVOSB Set-Aside or Not? GAO Sustains Protest of Ambiguous VA Solicitation.” YouTube, 2018. “Bundling Didn’t Allow Agency to Purchase FSS Open Market Items, GAO Says.” YouTube, 2018. “Sorry: No GAO Protests of U.S. Mint Procurements.” YouTube, 2018. Served as lead drafting attorney on a GAO protest of a procurement with a contract ceiling of $5 billion. Utilized technical background to successfully argue merits of an awardee’s technical proposal on a roughly $80 million procurement. Developed factual background and drafted successful protest of an ineligible awardee’s SDVOSB status. Negotiated favorable settlement regarding liquidated damages on a construction project. Drafted social disadvantage narrative resulting in admission into the 8(a) program. Researched and developed persuasive memorandum regarding unresolved applications of the non-manufacturer rule for submission to the contracting officer in support of small business set aside determination. Drafted multi-member Joint Venture Agreement and associated corporate documents with Small Business Administration regulations. 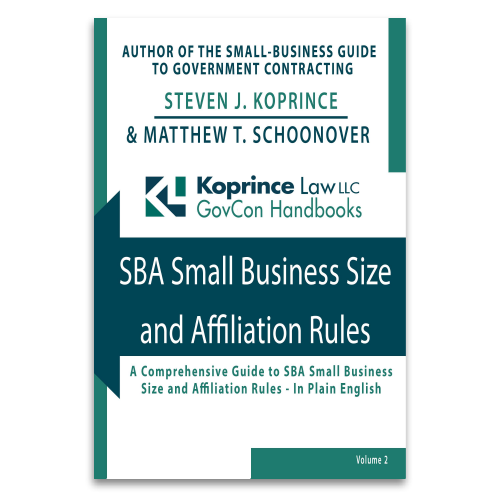 Established teaming agreement between small business prime and large business subcontractor. Provided advice regarding organizational conflict of interest concerns and other FAR requirements.